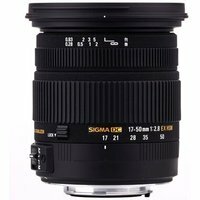 The Sigma 17-50mm f/2.8 EX DC OS HSM lens with Nikon fit is an image-stabilised, standard zoom for digital SLR cameras with an APS-C sized sensor. The lens covers a focal length from 17mm wide angle and offers a large aperture of f/2.8 throughout the entire zoom range, making it ideal for many types of photography including portraiture and landscapes. Alongside Sigma's Optical Stabiliser, the lens also includes a hypersonic AF motor, for quicker, quieter focusing.